A recent three CD project recreates the great 1625 Venice publication celebrating the “new” style of liturgical music. NOTE: All of the music on this program is from the recording Ghirlanda Sacra featuring the Ensemble Primi Toni directed by Nicola Lamon. It is on the Tactus label and is CD TC 620080. The collection of 44 motets for solo voice and basso continuo that was published in Venice in 1625 by Leonardo Simonetti appeared on the scene of early-16th-century Italian music as one of the most important works in the field of sacred solo-voice motets. The editor, a chorister in the Cappella Marciana, which was then conducted by the great Claudio Monteverdi, collected these pieces choosing them among the most important ones produced by composers chiefly from the area of Venice and Veneto. This anthology of motets, all of them magnificent, includes, besides Claudio Monteverdi, other composers who were active in Venice during the 16th century as choirmasters and organists in the churches of Frari, San Salvador and San Marco, and in the Venetian Hospitals: among them, there are Giovanni Rovetta, Alessandro Grandi, Giovanni Caprioli, Giacomo Finetti, Dario Castello, Francesco Usper, Carlo Milanuzzi and Bartolomeo Barbarino. From Musica Dei Donum: The year 1600 is often used as a pivoting point in the history of music. It is connected to the emergence of the seconda prattica or stile nuovo. Features of these are the monody - a vocal piece for solo voice(s) and bc -, the emergence of opera and the birth of instrumental virtuosity. However, these developments had their roots in the latter decades of the 16th century. Instrumental virtuosity was already present in the diminutions on vocal parts and large-scale vocal works with a theatrical character were performed before 1600. One feature of the monody was the concentration on the text and the communication of the affetti of a piece. This was prefigured in the late 16th-century madrigal in which words and phrases were often graphically depicted in the music. The monodic principle was first applied in secular music, for instance in Giulio Caccini's ground-breaking collection Le Nuove Musiche. It didn't take long until it was incorporated in sacred music as well. Most composers continued to write in the traditional polyphonic style, and that includes one of the main representatives of the stile nuovo, Claudio Monteverdi. At the same time many composers also experimented with the possibilities of the monodic style. One of the first was Ludovico Grossi da Viadana, whose Concerti Ecclesiastici date from 1602. In the next decades large numbers of solo motets were composed and printed. The two productions to be reviewed here bear witness to that. They show the variety within the genre, not only stylistically but also in scoring. On the one hand we find pieces which follow the bare principle of monody: one voice and basso continuo. The 44 motets in the collection Ghirlanda Musica are of this type. Marco Beasley has chosen solo motets and pieces for two voices, either with basso continuo alone or with additional parts for two violins. The monodic principle was extended to larger-scale pieces, scored for an ensemble of the 16th-century type, but with inserted (solo) vocal parts in monodic style. The Vespers Psalms by the likes of Viadana and Monteverdi are examples of this practice. Pieces for such small scorings could be performed various occasions. They were probably sung in domestic surroundings in the palaces of the aristocracy or in their chapels, but also in smaller churches which didn't have large musical forces at their disposal. This could also explain the variety in technical requirements between the motets in, for instance, Ghirlanda Musica. A superficial look at the scores suffices to conclude that some pieces are pretty straightforward whereas in other motets one sees some long strings of notes moving up and down. Solo motets could also be used in the liturgy of larger churches, for instance as part of the Vespers. Every Vespers Psalm was preceded by an antiphon which was to be repeated after the Psalm. However, it became common practice to replace the repeated antiphon with a vocal or instrumental piece. As the antiphons varied dependent on the time of the ecclesiastical year or the feast which was celebrated, maestri di cappella had to choose a piece with a suitable text. Ghirlanda Sacra reflects this. It was printed in Venice and edited by Leonardo Simonetti, a castrato singer in San Marco since 1613. This explains that the composers who are represented in the collection are from Venice or the region, the Veneto. It can also explain the large number of texts which refer to the veneration of the Virgin Mary. She was one of the patron saints of the city. Moreover, the Marian cult was an important element of the Counter-Reformation which started to take root. Although the motets are different in style and technique, most of them require skilled singers. Those pieces which look quite simple and omit any coloratura cannot be performed as they have been printed. A singer was expected to add ornamentation at various places, not in the first place to show off, but at the service of expression. The text had to be communicated, and to that end the rhythm should be treated with considerable freedom. The latter does not apply to strophic pieces, often based on a basso ostinato. Another important instrument was the messa di voce, a sudden crescendo followed by a decrescendo, to mark particularly emotional parts of the text. The performance of this repertoire is anything but easy. Technically it is demanding, but doing justice to the emotional content is even harder. Many recordings are technically alright, but leave much to be desired in the latter department. That is partly true for these two recordings as well. 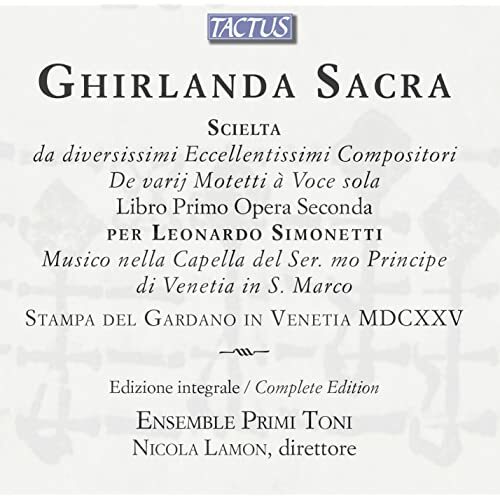 One could question the sense of a recording of the complete Ghirlanda Sacra. Obviously these pieces were not intended to be listened to one after the other. I certainly would not advise anyone to do so, as exciting as this repertoire is. Pieces like these come off best if they are included in a liturgical 'reconstruction'. That said, this collection is often mentioned in books and liner-notes, and its importance can hardly be overrated. This production's value is first and foremost documentary. That is even more the case as the performances are not always of the highest standard. The singers have all nice voices, and unstylish vibrato is avoided. However, in some motets the range of the vocal part causes considerable trouble. Especially Roberta Andalò and Jacopo Facchini sound sometimes stressed in the upper range of their voice. Diana Trivellato is the most authoritative of the sopranos. She has no technical problems and sings with great security. In regard to expression things are varied. Ms Trivellato is again top of the bill, and Raffaele Giordani makes a very good impression as well. In comparison Alberto Allegrezza is rather bland; he also adds very little ornamentation, and the same goes for Facchini, who sometimes adds no ornaments at all. In general this aspect is rather unsatisfying: the ornaments - improvised or written-out - are technically correct, but their application is rather inconsistent and sparse. Some pieces are preceded by a short instrumental introduction, either an existing piece or an improvisation, but again why it is added in some cases and not in others is anybody's guess. The connection between text and music will remain largely a mystery to those who don't understand Latin. A pdf document with the lyrics can be downloaded from the Tactus site, but it omits translations.